A UCLA-led team was the first to measure Greenland’s melting glaciers from the top of the ice sheet. Their discoveries could help scientists better predict sea level rise. The research, published today in the journal Proceedings of the National Academy of Sciences, offers new insights about previously unknown factors affecting Greenland’s melting ice sheet, and it could ultimately help scientists more accurately predict how the phenomenon could cause sea levels to rise. Since 2012, a team led by Smith has visited Greenland’s ice sheet several times, using satellites, drones and sophisticated sensors to track flow rates of meltwater rivers atop the glaciers, and to map their watersheds, which include the surface areas between the rivers. Smith’s team found a discrepancy between its data and the calculations of meltwater runoff from five climate models. Those models’ estimates were 21 to 58 percent higher than what Smith’s team measured on the ice. So Smith invited the scientists who created those models to collaborate with him. Together, they checked real-time statistics from weather stations on the ice to confirm that the data in the climate models were correct — and they found the models’ calculations were accurate. 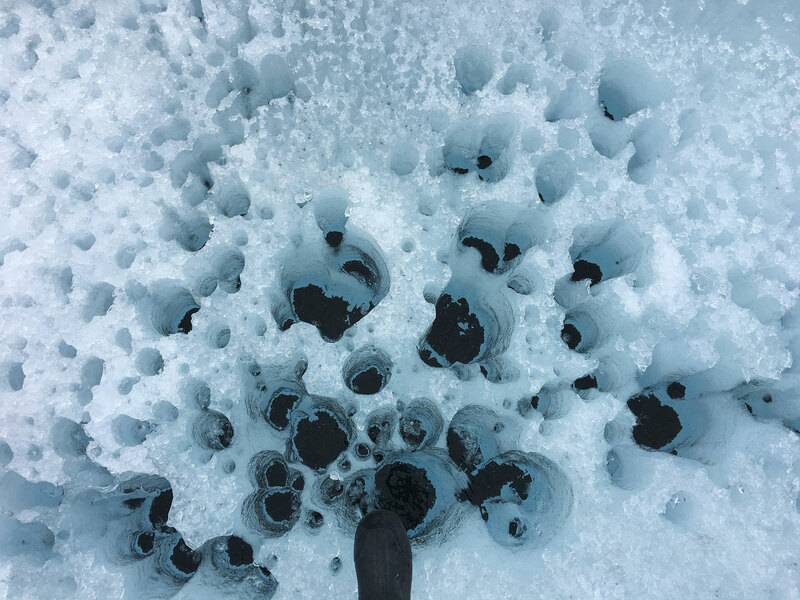 Which meant that the meltwater’s journey over the ice surface was more complex than previously imagined: The scientists recognized that before the water passes through the ice via moulins, it can pool, sit indefinitely or refreeze in porous ice at the surface, Smith said. “After eliminating all other possibilities, we deduced that the disagreement in our data is because of sunlight penetrating into the ice, causing subsurface melting and meltwater storage,” said Dirk van As, a co-author of the study and a senior researcher at the Geological Survey of Denmark and Greenland. “And now we know this is happening in the higher reaches of the bare ice zone that cover large regions of the ice sheet. “We now know that calculation of meltwater retention in porous ice should be included somehow,” he said. To measure river discharge on the ice, Smith and his team adapted a technique normally used on land. Working in shifts, they collected data hourly, around the clock, for three days in July 2015, braving the cold, wind and 20 hours a day of blazing sunshine. The researchers used safety gear to anchor themselves to the ice and protect themselves from the swift-moving water flowing into dangerous moulins, where surface water plummets into the ice sheet interior. Among the many logistical challenges was determining how to set up equipment to measure river flow in a way that researchers didn’t need to be positioned on both sides of a river. “Unless you have a helicopter, you can’t station people on both sides of a large river on top of the ice,” said Lincoln Pitcher, a UCLA doctoral student in geography, who figured out a way to keep sensors in place after trial and error on land and ice. They needed to come up with a stable and strong system that would stay in place even though the ice surface around them was melting. Study co-author, Asa Rennermalm, professor of geography at Rutgers University-New Brunswick was part of the field team. Van As said the project proved that combining expertise from multiple disciplines — among them meteorology, oceanography and hydrology (the study of the properties and movement of water over land) — is essential for fully understanding how glaciers and ice sheets respond to the climate system. “It is important that hydrologists like Larry bring their extensive knowledge into the field of glaciology, using approaches that are new to our discipline,” he said. In general, glaciologists are not accustomed to thinking about watersheds on top of the ice, Smith said. The irregularities those watersheds impart on the timing and amount of meltwater penetrating the ice are not currently considered in geophysical models of “ice dynamics,” meaning the speed and spatial pattern of sliding glacial ice as it moves toward the sea. Smith and his team now are working on a study based on data from a 2016 trip to Greenland, when they spent a week tracking watersheds and digging into the rotten ice. Led by UCLA graduate student Matthew Cooper, the researchers are attempting to better explain how rotten ice traps water. They have tracked the rotten ice to a depth of nearly 3 feet below the surface — a finding that could help scientists who develop climate models to better understand how ice sheets are losing mass. Part of Smith’s mission in Greenland is empowering a new generation of hydrologists who are eager to join the front lines of tracking global climate change. “Climate change is not remote news for me anymore,” said Kang Yang, a former UCLA postdoctoral scholar, who was part of the field team for this study. Now a professor at China’s Nanjing University, Yang will continue to work with Smith on mapping the rivers on Greenland’s ice sheet. Be the first to comment on "Researchers Provide New Insights about Greenland’s Melting Ice Sheet"